Leviticus 23 describes seven yearly sabbath days that, being tied to a calendar date like our holidays, fell on different days of the week each year. 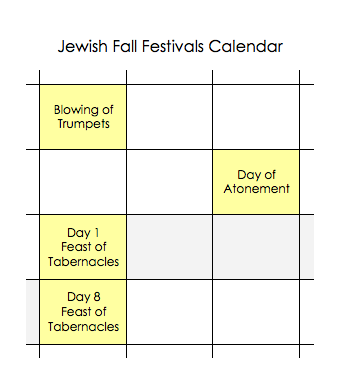 Each of these festivals pointed forward to some aspect of the plan of salvation. Like the weekly Sabbath, these holy days were to be sacredly held, no work being permitted for 24 hours from sunset to sunset. They were set apart for holy convocations. The Jewish ritual year began in the spring. Each month commenced at the first sighting of the new moon. The first three of the annual sabbaths related to the first month, and the last four of them fell within the seventh month of the ritual year. Here's the list as given in Leviticus 23. To help you visualize what this looked like on the calendar, I've prepared a couple of calendar segments. Think of these as depicting just three days of the week, rather than the whole calendar. 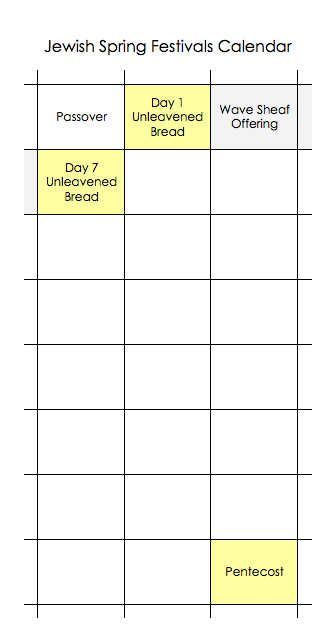 It reads just like a regular calendar except that it doesn't show the complete week. I did that because I didn't want to give the impression that these days fell on a particular day of the week. Remember, they are tied to a calendar date, calculated from the sighting of the new moon. The yellow dates are the ceremonial sabbath days. The gray shaded dates represent week-long festivals: the Feast of Unleavened Bread in the spring, and the Feast of Tabernacles in the fall. Only the first and last days of those week-long feasts were "sabbath" rest days. 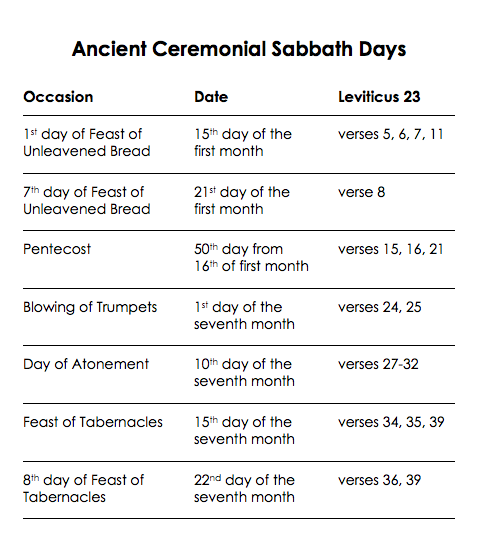 The Passover day and the Wave Sheaf Offering day, listed here, were not sabbaths unless they fell on a weekly Sabbath. As you can see, the day of Pentecost occurred seven weeks after the offering of the Wave Sheaf.